At Opulence Executive Travel, we offer state of the art vehicles for you to select and hire for your wedding in Blackpool, Lancashire. Opulence Executive Travel makes it convenient and reliable for you to hire a luxurious car for your wedding day. Our professional chauffeurs will transport you and your wedding guests to the church or wedding venue in style. Hummer H2 and Chrysler Baby Bentley Limousines – Fabulous limos with stunning and colourful LED-lit interiors, starlit ceilings, disco light, leather seating, and fully stocked bar for the ultimate VIP experience. Opulence Executive Travel has been providing luxury chauffeured wedding cars in all of Blackpool, Cleveleys, Pilling, Lancaster and the Lancashire area. Choose from our selection of Rolls Royce Ghost, Rolls Royce Phantom, Bentley Mulsanne, Chrysler Baby Bentley Limo and the modern Jaguar wedding cars. With its lively attractions and a wide choice of venues, Blackpool is a great location for a special wedding with a difference. So whether it’s a quirky ceremony at Blackpool beach or an intimate gathering at one the town’s many churches, restaurants or hotels, you’ll want to arrive in style. That’s where Opulence Executive Travel comes in. With a wide range of wedding cars in a choice of sizes and styles, Opulence Executive Travel has got something to suit every budget and taste. Our selection of luxury wedding cars is perfect for traditional and modern weddings and boasts models from Rolls Royce, Bentley, Chrysler and more. 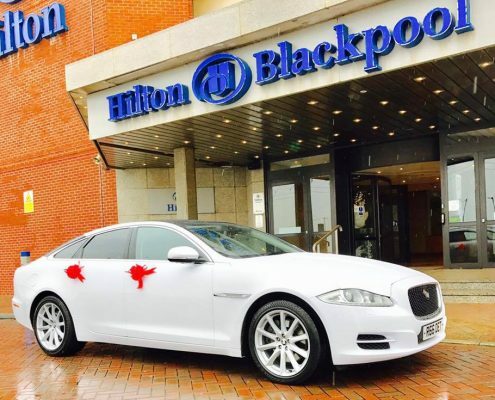 Complete with the services of a dedicated chauffeur, they’re available to hire for just a few hours, a whole day or half day throughout Blackpool and nearby areas. Contact us by dialling 08005 202030 and we will help you select the right car for your special day. Some of the top churches offering weddings in the Blackpool area are below. Blackpool is an unforgettable location for a civil ceremony or registry office wedding. Wedding Chapel Blackpool is a unique venue on Blackpool’s famous promenade, offering photo vistas of the beach. It has to be seen to be believed!